Firstly, my apologies as this is apparently my first blog in 2 weeks! I recently started university (waaah, so scary!) and with freshers, inductions, lectures etc., my life has become unbelievably hectic! I do, however, have a lot of bakes coming up, so keep your eyes peeled! Somehow, I actually managed to have an afternoon to myself last Sunday and, seeing as my brother had suggested I made some chutney, I though I'd man up and give it a go! Firstly, we had to sterilise the jar which, according to the instructions, needed to be immersed in water and have at least 3cm above it. This proved difficult as our largest pan had cauliflower in it (see above photo!) and we therefore had to use a pressure cooker. This was a laborious task but it allowed me to do all the prep needed. Adding the red wine vinegar really made me excited about the chutney, it smelt beautiful! There was absolutely nothing difficult about this recipe, we literally threw everything into the pan and watched it simmer. 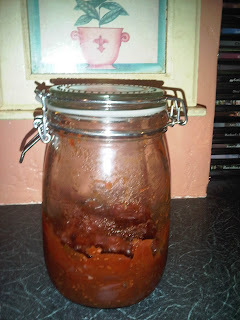 Despite the long wait, it eventually broke down and produced a lovely chutney which tasted more oniony than tomatoey but is delicious nonetheless! Apologies for the poor photo, it had been eaten by the time I got to take a photo and it was dark! 4 cm piece ginger , peeled and chopped- we didn't use this, no one but my mum likes it!